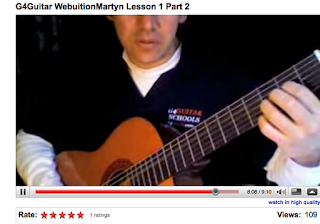 Guitar Blog: "Who needs a guitar teacher when you've got Youtube?" "Who needs a guitar teacher when you've got Youtube?" I recently spoke to a guy who said he was a self professed cynic when it came to guitar teachers. He claimed that there was nothing a guitar teacher could teach him that wasn't somewhere on the Internet for free. He claimed anything and everything you would ever want to know about guitar is probably on the net somewhere. While I understood what he was saying I pointed out that there was one very distinct and critical element missing. The net can't see your mistakes or really understand what your next best step should be. The net supplies information but offers no feedback. While the net may save you a few dollars the cost of a good teachers is made up in time. If you work your time is money and if it takes you one hour a day of surfing the net to find what you need (assuming it is what you really need) thats 5+ hours a week in lost time. Surely that's more expensive than a weekly guitar lesson. Any great coach knows that information accounts for about 10% of success. The rest is psychology. The net for all it's knowledge doesn't understand your emotions and how this plays a major role in you ultimate success. More than 90% of beginner guitar students will give up within 12 months and the reasons are related to the mind. Typically students who fail to follow through will say they didn't have time or it just wasn't for them or it was boring. The truth is we give up our goals when we are not seeing results as quickly as we would like. We become disillusioned and lose faith and when we rely on the net to be our teacher we are unlikely to get that much needed pep talk. I am yet to meet someone who can't spare 30 minutes a day to practice guitar. If the average person spends 5 hours a day either surfing the net or watching TV or Youtube they can surely find 30 minutes a day to practice guitar. A good teacher will hold you accountable. They will be waiting for you each week to check whether or not you have put in the time and will be asking why not if the practice is not done. We all do better when we have someone checking up on us. Those who don't value a good coach I find are those who aren't truly serious about achieving their goals. When we are committed to our success we do whatever it takes. Many claim that they cannot afford a guitar teacher but this is rarely true. The cost of a lesson is well within the budgets of most people today. If you are genuinely not able to afford guitar lessons perhaps you can speak to a guitar teacher about working for your lessons. Remember guitar teachers are in business so maybe you can exchange some of your time for their time. There is always a way.